Marble veneer is a thin layer of real marble installed over another surface to make it appear that the entire surface is real marble. This is done as a cost-cutting technique, and is common in marble furniture and countertops. Because the marble veneer is real marble, it must be cared for in the same way you would care for marble. 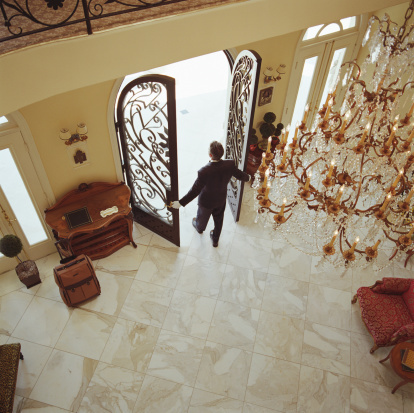 Never use acids or abrasive cleaners, as they can scratch, etch, or discolor the marble surface. Fill a sink or bucket with warm water and mild soap, such as liquid dish soap, laundry detergent, or powdered dish detergent. Dip a soft cloth, sponge, or soft-bristled nylon cleaning brush into the soapy water. Scrub the marble veneer to remove all dirt, dust and residue. Dampen a soft cloth in cool water. Wipe away the soap residue left by the cleaning mixture. Use a lint-free towel to dry the marble veneer. This prevents water spotting. Dampen a cotton ball or cotton cloth with either hydrogen peroxide or ammonia. Do not use both at the same time. Wipe the stain with the dampened cotton ball or cloth. Lay the dampened item over the stain to keep the stain from drying out and to allow the liquid to work into the stain. Let the cleaner sit on the stain for five minutes. Dampen a soft cloth in cool water. Wipe away any residue. Use a lint-free towel to dry the marble veneer.